We at CR Foundation are pleased to make a new resource available to you: The Single Topic article. Offered exclusively online, this feature is a product of the feedback we’ve received from doctors desiring a more à la carte option. 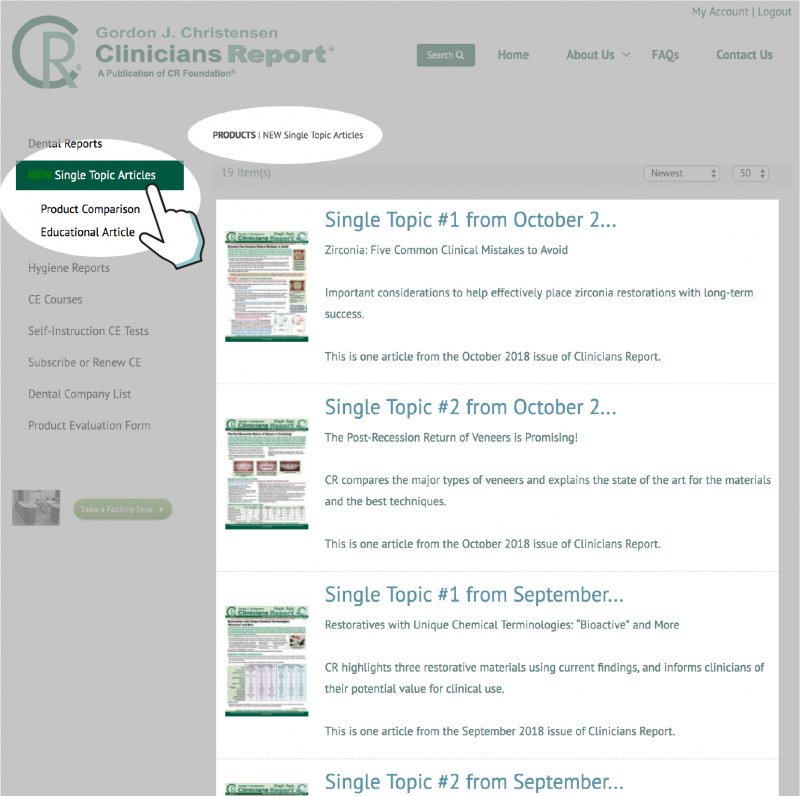 Now you can purchase stand-alone articles extracted from their full-length issues of Clinicians Report®. Just like full reports, Single Topic articles will appear in your general search results. For example, this is a screen shot of the results from a zirconia keyword search. 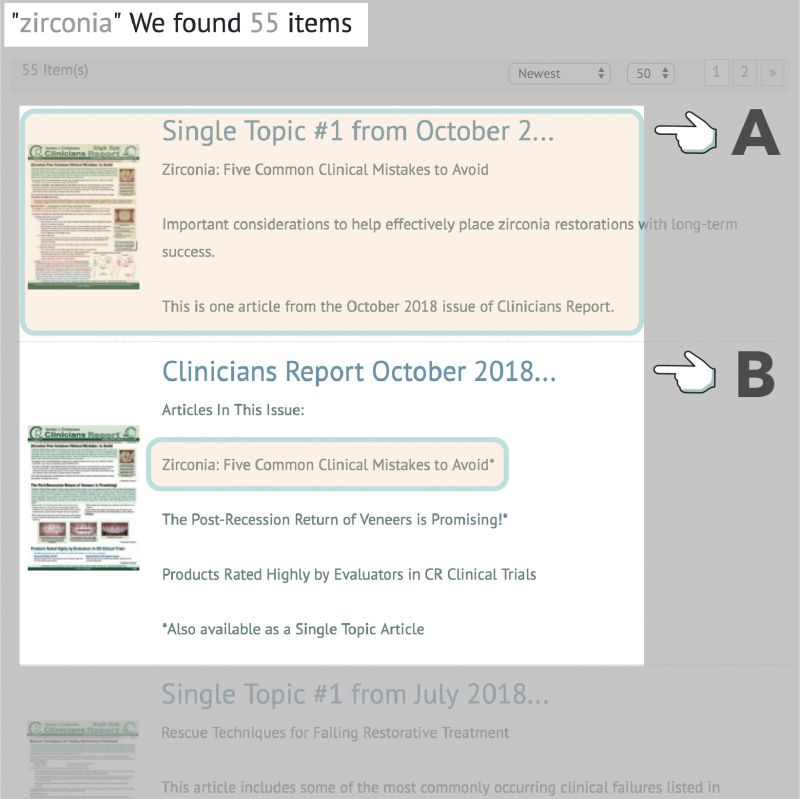 Search result A is a Single Topic article entitled Zirconia: Five Common Clinical Mistakes to Avoid. Notice this article also appears in the full-length, October 2018 issue of Clinicians Report (Search result B). note: Aside from minor formatting adjustments, an article in Single Topic form is identical to how it appears in the full-length report. You can also find Single Topic articles by following links on the product page of a full-length report. 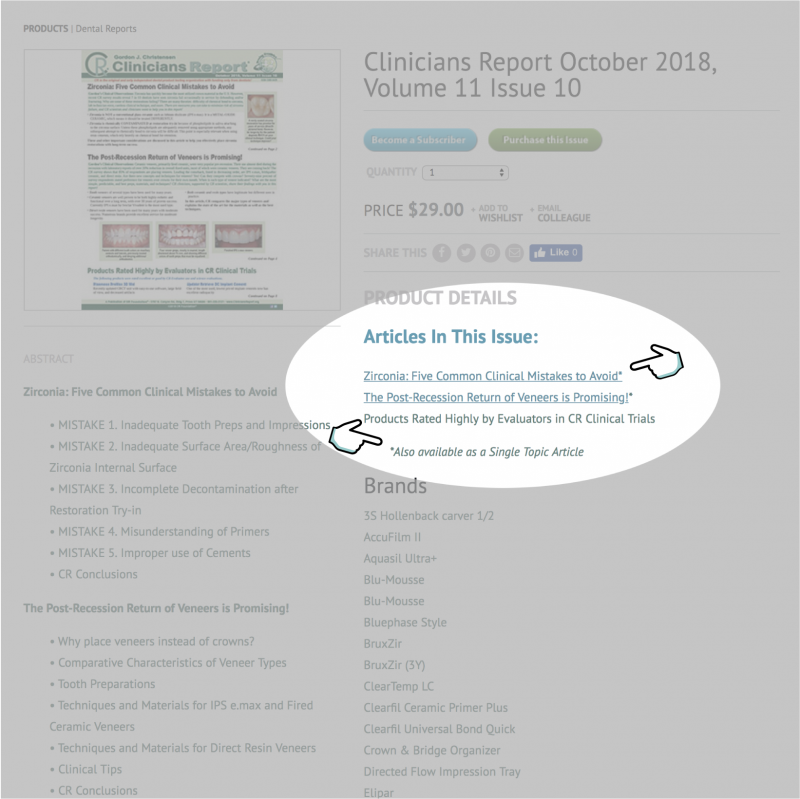 Let’s say you’re on the product page of the Clinicians Report October 2018 issue, and you’re wondering if you can purchase one of the articles from that issue in stand-alone form. Those titles listed in the PRODUCT DETAILS section that are accompanied by an asterisk* are available as Single Topic articles. Clicking on the article name will take you to its Single Topic product page. To browse Single Topic articles exclusively, click “Single Topic Articles” on the Left Navigation bar. This will reveal every Single Topic article that CR has to offer. You can further narrow your browsing by clicking one of the two categories listed in the sub-menu that appears: Product Comparison and Educational Article. Product Comparison articles feature tables and charts that compare key information on multiple products. Education Articles cover everything else, from detailed clinical technique to How to Survive a Bad Day at the Office. As always, if you have any questions or difficulties, please feel free to reach out to us.